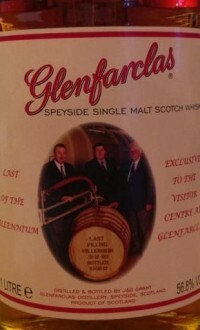 Glenfarclas has released a special “Last of the Millennium” bottling exclusively for visitors to the distillery in Speyside. The cask was filled on December 31, 1999 by three generations of the Grant family: George S. Grant, who passed away three years later, John L.S. Grant, the current chairman of the company, and George S. Grant, the sixth-generation member of the family currently serving as Brand Ambassador for Glenfarclas. The cask was bottled at 56.8% ABV, and is available at the distillery for £59.99 per 1-litre bottle.